I can’t explain the bag monster phenomenon, but it really does exist. Unlike the pathetic, inconclusive attempts to capture accurate proof that MMM will return, I witness bag monsters almost daily. The reason this ridiculous concept has been swirling around my head is because recently at a group outing one of my male friends made a comment as I was rifling through my mini suitcase. “Dumebi, you realize that men are, in fact, are actually scared of a woman’s bag…” my friend said as he suspiciously and anxiously awaited what kind of prop I was going to pull from my magic, rabbit hat of a bag. He continued-“We just don’t get it, what could you possibly need so badly, that you have to carry around with you a full-on trunk?” It was in that moment that the myth became reality and I had become one of those girls who conveniently schleps around a monster everywhere she goes. So to further investigate why I can never find my keys, why I lose my coloured pens and highlighters into the pit of despair each time I toss them in the bowels of my bag; I dumped out my bag and the extensive contents poured out like a dramatic scene from Hoarders . 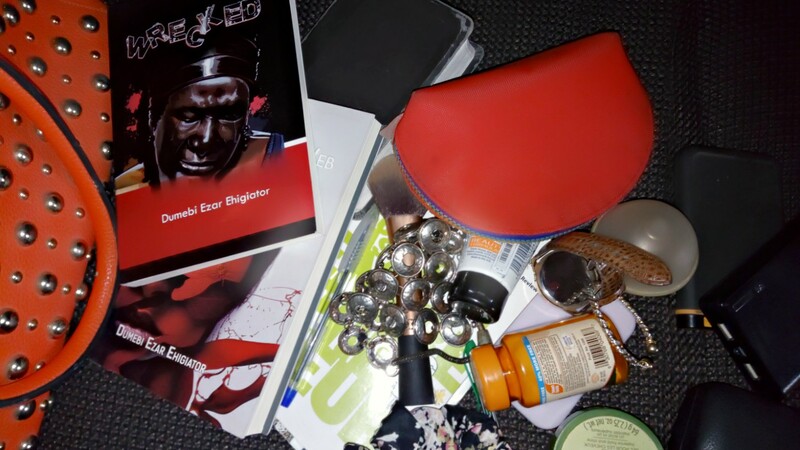 I had the typical items: my phone, a medium size makeup case, lip gloss (in 6 differnt shades which is completely understandable), sunglasses, reading glasses, powerbank, external drive, wristwatches, chains, bracelets, dozens of pens, copies of my books, my Bible, a business book, my journal, anointing oil and my business card case. In addition to that impressive stockpile, however, I also had a palette Le Boo gave me for Christmas, my checkbooks, headphones, a packet of gum, a small pack of Kleenex, Diclophenac, tweezers, nail clippers, a nail file, a wallet the size of Oyo, a headband, Vitamins, a bra set (that needs to be returned) and a plastic bag with chocolate that I need to drop off for a friend (honestly). While I could certainly go into silly details of the contents bursting out of my wallet or the unnecessary receipts, and loose naira bills/change lining the floor of my purse; I will spare you. The point is that it’s an actual phenomenon; not so much the obscene amount of things we tote around with us, but the fact that somewhere along the way we were taught that all of this stuff is necessary to have readily available on any given day. 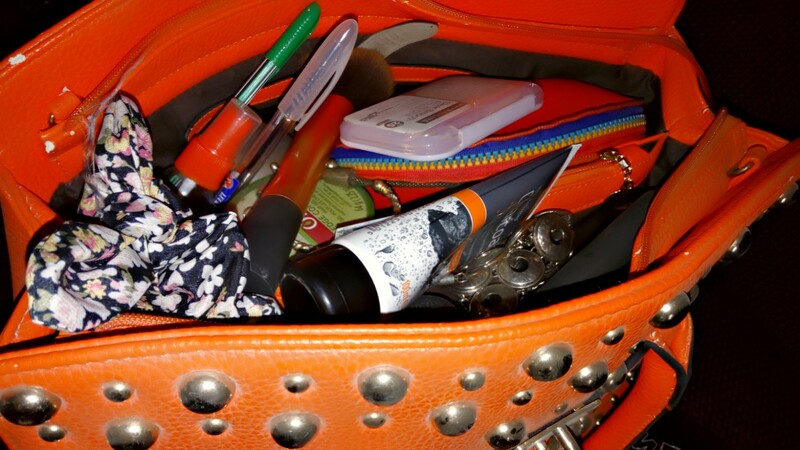 The irony is that I used to dread getting something from my mom’s bag when I was little because it felt like it was a booby trap or a frustrating, mind-bending scavenger hunt. Now, I have become my mom. One of my New Year’s resolutions was to droo baggage (human and otherwise). I no longer want to feed the insatiable appetite of my bag monster. While I’m focusing on the insanity of overstuffed bags, it is actually a greater indication (for me) of the overwhelming content of my life, the full plate I eat from daily and the endless amount of balls I’m attempting to juggle. I’m working on being more intentional, thoughtful and organized. My enormous bag is definitely a good place to start. So, R.I.P. bag monster. It was good while it lasted. Posted on January 7, 2017, in Uncategorized and tagged Bag monster, excesses, living, resolutions. Bookmark the permalink. Leave a comment.